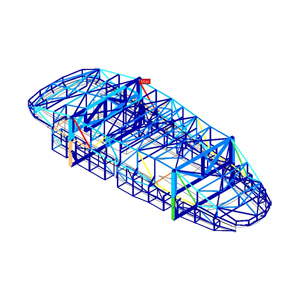 FEA-Solutions (UK) Ltd - Finite Element Analysis For Your Product Design | 534: Superstructure Mould Static stress analysis to simulate the rotation of a superstructure mould and its supporting steelwork during manufacturing. Detailed recommendations were given to achieve maximum stiffness at minimum weight. Static stress analysis to simulate the rotation of a superstructure mould and its supporting steelwork during manufacturing. Detailed recommendations were given to achieve maximum stiffness at minimum weight.